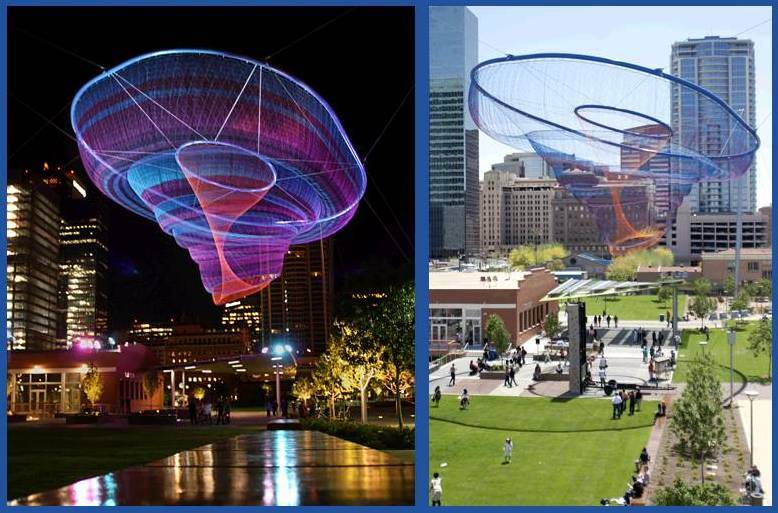 American artist Janet Echelman has worked in numerous mediums throughout her career and has a long history of working collaboratively with communities outside of her own culture, whether it be Balinese textile artisans or Indian bronze castors. A Fulbright lectureship about painting brought her to Mahabalipuram, India, a fishing village in Tamil Nadu famous for sculpture. But it was watching the millennia-old craft of weaving and working with nets that ultimately inspired the work that now defines her art. When she watched the men making piles of nets on the shore she began wondering if the material was “a way to create volumetric form without heavy, solid materials.” Working in collaboration with the fishermen, she wove the netted creations that were experiments in the convergence of form and the elements. Beginning with an airy woven installation hovering over a Portugal seaside, now Ms. Echelman’s pieces grace museum atriums, metropolitan skylines and the unlikely, yet intriguing places such as a highway overpass on I-45 in Houston, Texas or Manhattan’s Westside Highway. Each piece is meant to fit into its environment, and she is inspired by both the natural world–think elegant medusas floating in tropical waters (She Changes, in Porto, Portugal), or the Aurora Borealis (Her Secret is Patience in Phoenix, AZ, viewed above) as well as cataclysmic events like earth quakes (1.26 in Denver, CO) and funnel clouds (The Expanding Club, NY, NY). Created with a range of fibers, and varied techniques, they all share the fluidity and plasticity of art combined with the effects of air currents, water particles and light. A proposed art installation in front of the historic Dilworth Palza in Philadelphia, PA is particularly fascinating because it will use mist and light in place of the more solid (but equally ephemeral looking) fibers she usually employs, creating a “painting” of water vapor and light that traces the paths of the underground transit system below. Because of the constantly shifting range of materials for each installation, Ms. Echelman collaborates with a range of professionals including aeronautical and mechanical engineers, architects, lighting designers, landscape architects, and fabricators. In this TED Talk, Ms. Echelman speaks of the road she followed in learning to take imagination seriously.